The view from Kajinho and its yard is unbeatable, and expecially sunsets are outright gorgeous. Ask about anyone whether they have heard about a pizza place called Kajinho in Motobu, and you are very likely get a blank stare. But ask about “Pizza in the Sky” and everyone knows it. Such us the fame of this restaurant that people on weekends wait for hours to get in. Kajinho serves only one kind of pizza in two sizes. But what really makes the difference with Kajinho is the view. 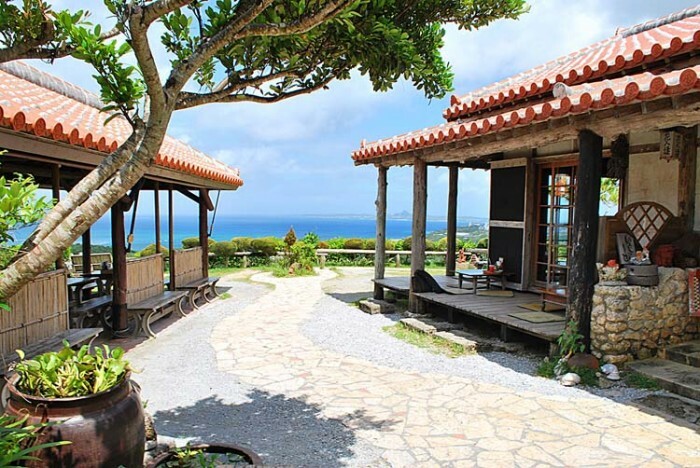 This little restaurant is located on top of a steep hill, where one can enjoy the view of Ie, Sedoko and Minna Islands and it also practically overlooks the Expo Park, and the sunset from the patio is especially gorgeous. 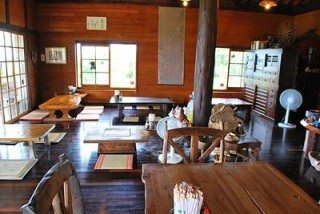 The restaurant itself is in an Japanese old style house with seating on the floor. Additional seating is outside of the house on a separate patio. The place is open from 11:30 a.m. to 7 p.m. with the last order at 6:30 p.m. It is closed on Tuesdays and Wednesdays. Payment is in cash only, no credit cards accepted. The menu is very simple. The restaurant serves only the on kind of pizza of the day, and one kind of salad. Both come in two different sizes. 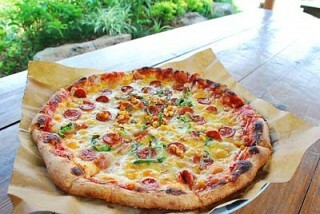 The pizzas are hand-made on the premises with plenty of cheese. The Okinawan-style house has seating on the floor by low tables. More comfortable seating for westerners is on the outside patio. For drinks there are orange juice, tea and beer. During the summer months they offer fresh acerola juice that is locally produced in Motobu. In the garden outside there is a collection of shisa pottery and other old artifacts. The place is a little tricky to find without a car navigator or Google map. http://kajinhou.com/english/kajinhou.html Their address is 1153-2 Yamazato, Motobu Town, Okinawa, and telephone number 0980-47-5537.